Thomas D. Benson, Sr., of N Park Avenue in Waubeka, died October 16, 2013 at Aurora Medical Center, Grafton. He was born in Milwaukee, Wisconsin on May 12, 1935 to William and Esther Doyle Benson. He married Virginia Ryder of Crivitz, Wisconsin on August 4, 1956 in West Allis, Wisconsin. They moved to Cedar Grove in the 1970’s and later moved to Waubeka, residing there for the last 20 years. Thomas worked for Northwestern Wrecking in Milwaukee for many years before working at EST Corp. in Grafton until he retired. He loved spending time with his grandkids and was always ready to help with school projects. 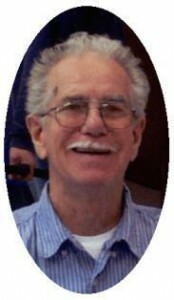 He was a creative man with a great sense of humor and enjoyed woodworking and telling a good story. He liked to travel with his wife, fish and take a trip to the casino once in a while. He is survived by his wife Virginia of Waubeka, sons Tom Benson, Jr. of Adell and Tim Benson of Port Washington. He is further survived by his grandchildren Kyle, Tyler, Shain and Jessica, other relatives and friends. He is preceded in death by 2 sisters and 2 brothers. Fr. Guy Gurath will officiate funeral services 2 pm Saturday, October 19, 2013 at the funeral home. Visitation from 10 am to 2 pm Saturday at the funeral home. Memorials to the family are appreciated.